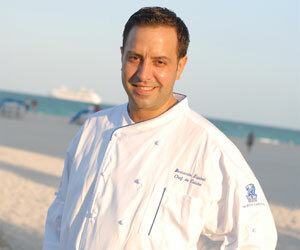 Chef Bernardo Espinel loves to travel. He loves to cook, too, and it's his passion for both that makes his cuisine so special. TravelsinTaste.com recently caught up with Chef Espinel, who is Chef de Cuisine at Americana, the signature restaurant at the Ritz Carlton South Beach, to discuss the origins of his culinary inspirations, as well as his favorite ingredients and his idea of a chef's ultimate getaway. An experienced and avid traveler, Chef Espinel has found culinary inspiration all around the world, discovering new flavors and tastes while sampling local cuisine from communities and cultures across the globe. Of all the global ingredients he's tasted, though, Chef Espinel loves spices most. They're flexible and versatile, he says, and no matter what he can always find unique ways to combine them in order to create something new. Of course, spices aren't the only ingredient that holds a special spot in Chef Espinel's culinary heart. He also has a strong affinity for fresh produce, which he says is an absolute must in his kitchen. He pays particular attention to the seasons in order to secure the absolute freshest and finest produce for Americana. As such, his favorite season of the year is late summer to early fall, when the largest variety of produce is available, including tomatoes-one of his favorites-as well as summer fruits and winter squashes. Some may think being a chef is an easy job. Well, according to Chef Espinel, it isn't. In order to keep current, he says one must always try new creations, which means visiting many places and eating at many different types of restaurants within those places. Sometimes, the meal is good, sometimes it's average and sometimes it's even the most memorable meal you've ever had. Chef Espinel should know. He's been lucky enough to experience two utterly outstanding meals to date. The first took place at the River Cafe in London, where he says the menu was focused on seasonal ingredients and simple preparations. The Michelin starred River Cafe originated in 1987, and is known for revolutionizing Italian food in the United Kingdom. It was designed by Richard Rogers, who partnered with Renzo Piano to create the Centre Pompidou in Paris. It's currently run by Rogers' wife, Ruth, in partnership with Rose Gray. Still haven't heard of it? River Cafe served as the training ground for Rogers' former sous chef, Britain's well-known celebrity chef and cookbook author, Jamie Oliver, who is star of the Food Network's "The Naked Chef."